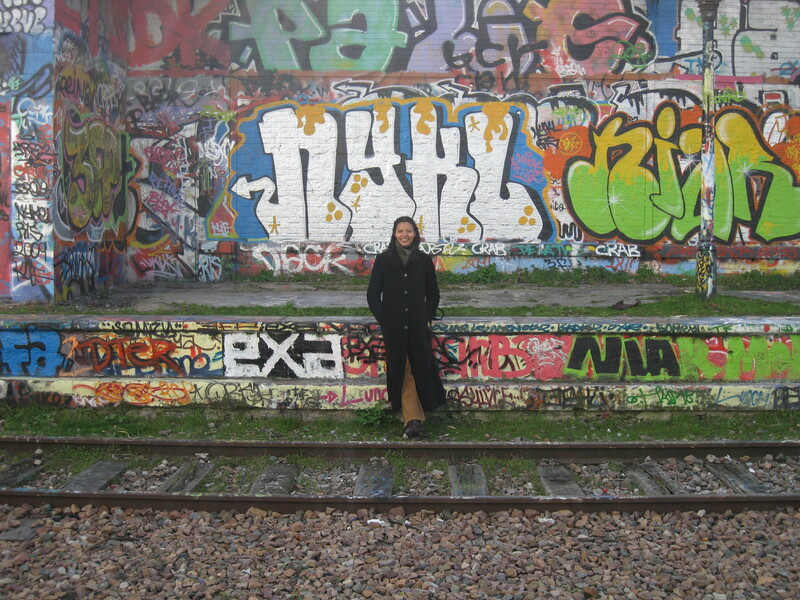 If I say that the Petite Ceinture is one of my favorite Paris discoveries, don’t think I’m talking fashion. While La Petite Ceinture literally translates as “The Little Belt,” it actually refers to the abandoned rail line that circles the city. This past weekend, as part of “Sustainable Development Week” in Paris, the Association Espaces led small group tours along the Petite Ceinture. Rumor has it that this little “beltway” will finally be turned into a nature trail soon. The cold, rain (and sometimes hail!) kept me from going on the walk (plus the fact that I hadn’t signed up in advance). But that’s ok. I already have a key to the Petite Ceinture! Yes, it’s true. You see, Jerome’s atelier is part of a converted train station in the 20th. The Petite Ceinture runs just above. We’d explored portions of this hidden wonder before he found his atelier, but it’s certainly nice having such easy access now. Jerome has scaled walls before to explore the Petite Ceinture. I’m not quite that committed. My first experience was a simple (big) step up near Porte Doree in the 12th. You won’t see “keep out” signs posted, but the Petite Ceinture is not exactly, ahem, *open* to the public. (Meaning, we’re not technically supposed to go snooping around here – call me a rebel). Keep your eyes peeled for these tantalizing tracks from a bygone era. You can spot them near Buttes Chaumont Park or as you sip cocktails at Philippe Starck’s design hotel Mama Shelter. Really, just look up, down, and around when touring the outer arrondissements and you might start to see them everywhere. This weekend’s walk covered the portion around the 15th, a part of the rail line I haven’t had the pleasure yet to explore. From a few photos I’ve seen of that area, I can see why local activists are angling for a nature trail. Apparently there are 200 species of flora and fauna to be found. I’m familiar with the more urban parts: ancient tracks overrun by weeds, tags and graffiti on whatever walls can be found. I love the proximity to the street in some areas – close enough that you can see the details of life as it happens. Far enough that you feel almost invisible, like you’re surveying the city in secret. The Petite Ceinture offers a new perspective; Paris autrement. 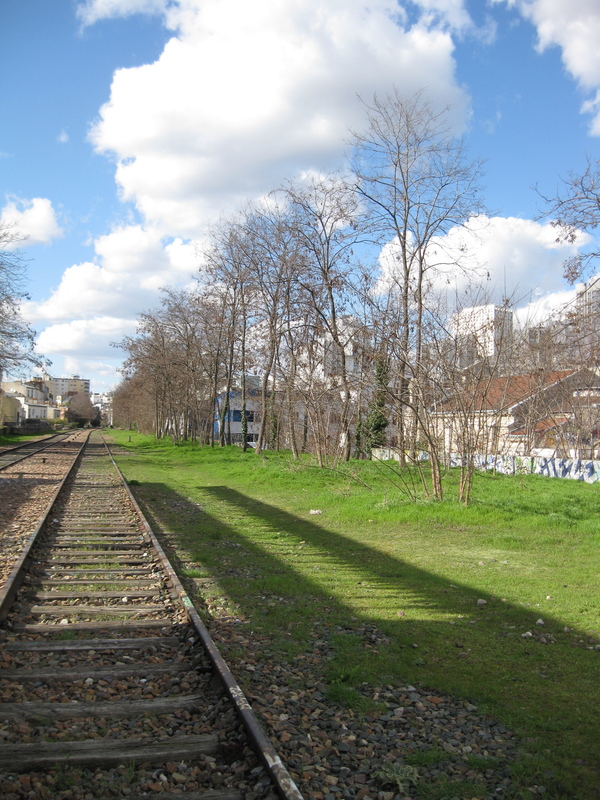 Have you explored the Petite Ceinture? Know any access points? Happy to hear about plans to make it public – or a bit sad that the secret will soon be out? Sounds interesting. I’ve never explored the tracks, but like they way you describe being able to observe the city from them. Will have to check it out next time I’m in Paris! My son is coming to France in May and spending 5 days in Paris. I’m passing your blog on to him. He would love this! As would I…so next time I’m in Paris…. Not to put too fine a line on it, but just so everyone knows: the Petite Ceinture *is* private at the moment so there are no signs or anything pointing the way (i.e. we’re not really supposed to be there 🙂 ) But if you’re armed with adventure and have found an easy access point, anything is possible, right? Nice photos – and I’m very interested in this idea of having a key! Don’t forget also that some parts of the system are still in use – they have been converted into a section of the RER C. Other parts are already being converted into a nature reserve and public footpath, especially in the southern section near the Porte de Versailles. The portion you describe is more delicate. The tracks are still in place and may always stay there because they are still the only rail links between some stations such as the Gare de Lyon and Gare de Nord. I knew I could count on you for even more info. Thanks! I didn’t realize part of the system was converted into a section of the RER C.
Do you know if there are any sites tracking the progress or where I can get more information? Would love to explore more. Yep, I love the highline, too. I’ll probably write about another favorite elevated walkway here, as well: La Promenade Plantee in the 12th. This was apparently the first ever elevated garden path. Way to go, cities, for re-making the old into really cool things! 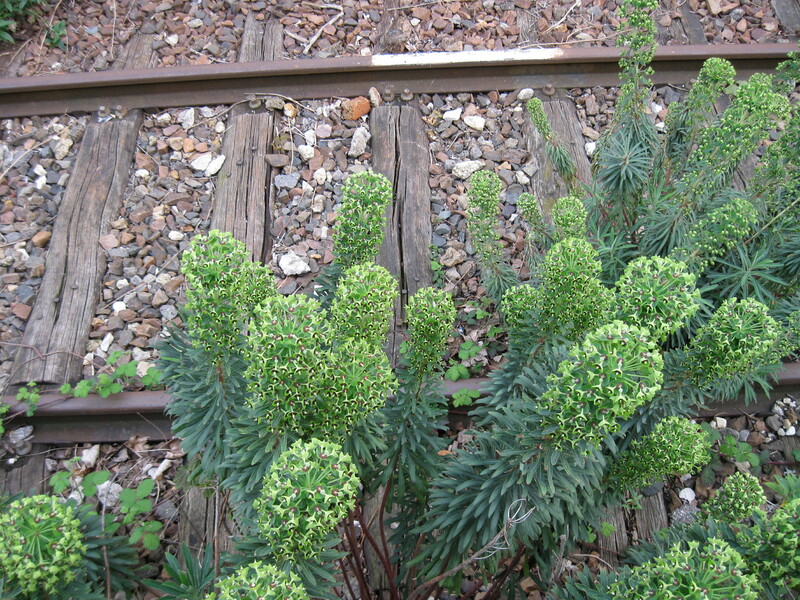 Hi, I was researching the Petite Ceinture for a plan of its route and found your blog! Good for you for being interested in it too. I’ve never felt brave enough to actually walk it – not wanting to scare anyone or anything, but there are some marginal characters down there you know! Hi Sab! Yes, I’m very interested in the Petite Ceinture – have you learned any cool facts from your research? It’s true what you say – I’ve always walked with someone else (and a man) when I’ve walked along the tracks. I think some areas are probably shadier than others – I’ve never had any problems on the tiny stretch I’ve seen. But, you never know! I have long been fascinated by the Petite Ceinture, and was pleased to find a map dating from 1897 at a bouquiniste’s stall that showed all the Petite Ceinture stations around the edge of the city. (I’ve posted the map at http://parisianfields.wordpress.com). When I’ve walked over it on bridges, I’ve sometimes seen people walking down there, but I’ve never had the courage to go down myself. Maybe next time! Thanks for this post.